The General Awareness section plays a vital role in any competitive exam. This is the only part where most of the candidates fail to answer the questions. Hence, to help all those individuals in gaining some knowledge about General Awareness and in scoring good marks, we have provided some GK Questions on different topics of General Awareness on our website. 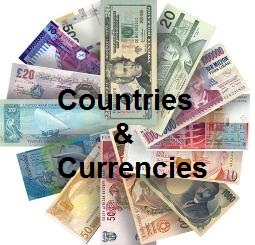 As a part of it, on this page, we have given a list of Countries and their Currencies. Therefore, the individuals must go through the Countries and Currencies of the World and must improve their knowledge regarding General Knowledge. Therefore, the complete list of Countries and their Capitals with Symbols have been provided in the above table. So, the candidates must go through this article thoroughly and must prepare well for their competitive exams. Visit our GK Page, to get GK on various topics of General Awareness.